Freshcare Fee Structure – Effective from 1 August 2018. Freshcare fees are increased in line with annual consumer price index (CPI) to assist with the growing costs of running the business. This year, the increase of 1.9% (rounded) as released by ABS for the quarter ending March 2018, has been applied to all fees for the 2018-2019 financial year. The increase of 1.8% as released by ABS for the quarter ending December 2018, will be applied to all fees for the 2019-2020 financial year, effective 1 July 2019. * Applicable only when annual Food Safety & Quality (FSQ4) and Environmental (ENV3) audits are conducted together or within a 6 month period, for an individual participating business. ** Applicable only when triennial Environmental Viticulture and Environmental Winery audits are conducted together or within a 6 month period for an individual participating wine industry business. Freshcare is an industry benefit organisation with Freshcare Fees captured to contribute to the day-to-day operational costs and further developments of the Freshcare program. Freshcare Fees are supported by external project funding to keep the costs to participating businesses to a minimum where possible. 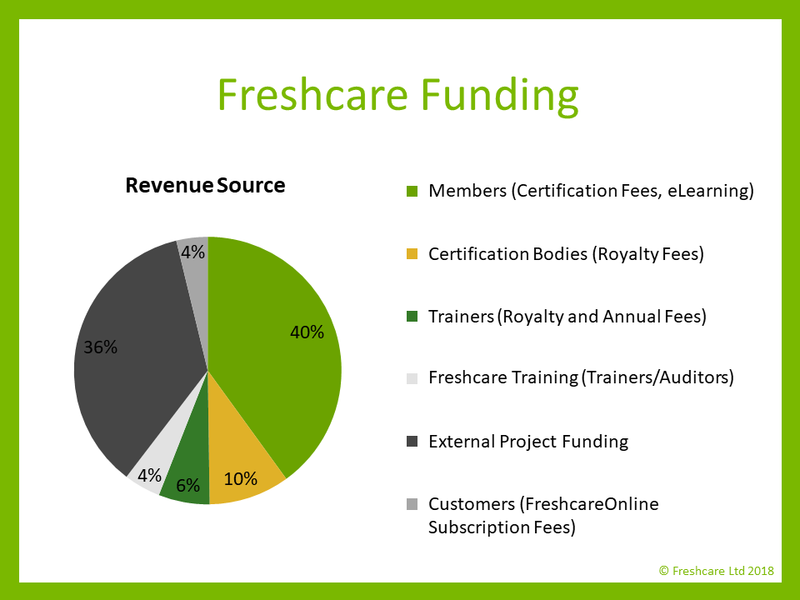 The Freshcare Funding graphic below (correct as of 30 June 2018), indicates the revenue sources that cover the ongoing costs of the Freshcare program. Freshcare funding graphic revenue sources (correct as of 30 June 2018). Note: The details above outline the fees set and derived by Freshcare only. Participating businesses will have additional costs (not set by Freshcare and independent of the fees outlined above) associated with training, implementation and auditing of the Freshcare Standards. For more information on the costs associated with training and audits, please visit our Training and Certification pages.